Welcome to this December Ask the Expert event. Its been a busy 2014, with lots of challenges. But we hope, in some small part that the series of Ask the Expert events helped you meet those challenges . As we move into wrap up mode on Ask the Expert in December, we certainly don't take anything off the pace of events and offer another discussion opportunity to you on Connectrix FOS 7.3 and the new integrated Fabric Vision capabilities. In particular this discussion will address proactive capabilities to manage your products and maximize availability. Monitoring and Alerting Policy Suite (MAPS): Provides a new, easy-to-use solution for policy-based threshold monitoring and alerting. MAPS proactively monitors the health and performance of the SAN infrastructure to ensure application uptime and availability. Connectrix B-Series ClearLink diagnostics: Ensures optical and signal integrity for Gen 5 Fibre Channel optics and cables, simplifying deployment and support of high-performance fabrics. Flow Vision: A comprehensive tool that enables administrators to identify, monitor, and analyze specific application data flows in order to maximize performance, avoid congestion, and optimize resources. Integration into Connectrix Manager: CMCNE simplifies Gen 5 Fibre Channel management and helps users proactively diagnose and resolve issues to maximize uptime, increase operational efficiency and reduce costs. Fabric Performance Impact (FPI) Monitoring: Uses pre-defined thresholds and alerts in conjunction with MAPS to automatically detect and alert administrators to severe levels of latency and identifies slow drain devices that might impact the network. Check out this 3-minute video on the new Fabric Vision capabilities to earn the brand new "Video Visionary" badge. By participating in this discussion and commenting on a new Connectrix blog post, you can also earn other badges through the "Connectrix Experience Optimizer" RAMP Mission. For this discussion, we have a rock-star team with diverse and deep experience working with Fabric Vision technology and customers. Michelle Hughes has held multiple roles at EMC and Brocade as both a Technical Support Engineer and OEM (Original Equipment Manufacturer) Systems Engineer. She is currently the Director of OEM Systems Engineering at Brocade. Michelle’s robust technical skill set includes expertise in fibre channel, Ethernet fabrics and EMC storage technologies. Mike Naylor is Director of OEM (Original Equipment Manufacturer) Business Development at Brocade. Mike has 25+ years of experience working in the technology industry, including over 8 years focused on integrating Brocade capabilities with EMC products. He is an expert in storage networking. Bill Sleck has been part of the EMC family for 17 years and has held positions in Enterprise and Midmarket as an account Systems Engineer (10 years), at OEM (Original Equipment Manufacturer) partners, and in his current role as a Consulting Corporate Systems Engineer and Program Manager on the EMC Global Connectrix team. Bill Cross is a Global Services Product Manager with EMC and has supported the Connectrix family of products for over 16 years. His experience includes 12 years focused on driving quality and reliability into EMC products as a member of the Corporate Quality team and 4 years in his current role. This discussion takes place from December 8th - Jan.26th (Note: There may be a delay in response from Dec. 23-Jan.5 given the US holiday schedule). Get ready by bookmarking this page or signing up for e-mail notifications. Welcome to the Connectrix B-Series Fabric Vision Ask The Expert. The Connectrix B-Series Fabric Vision technology provides unprecedented insight and visibility across the storage network with powerful built-in monitoring, management, and diagnostic tools that enable you to maximize infrastructure uptime, dramatically reduce costs, and optimize application performance. We look forward to a lively interaction and informative discussion on the benefits of Fabric Vision. 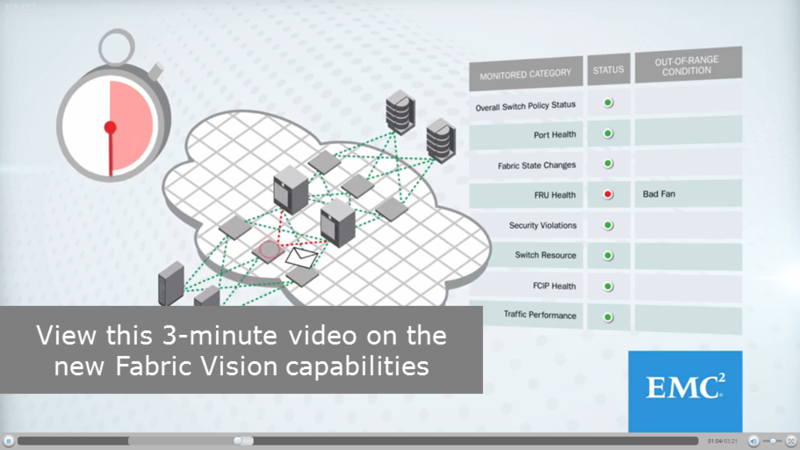 Please take time to view the 3 minute video on Fabric Vision capabilities and leave us a comment, read the blog (https://community.emc.com/community/support/blog/2014/12/05/brocade-blog), and finally ask us a question on Fabric Vision Technology. I'm looking forward to some good discussion on this. We recently upgraded a lot of our fabric switches to FOS v7.2.x and our Connectrix Manager instance to v12.3.1. I think I'd like to kick off the questions with a clarification about which of the features we are talking about here require FOS 7.3 and which we can use at earlier versions. I know at least SOME of this is available at FOS 7.2. Can you also clarify right off the bat which of the features have hardware dependencies? For example I believe the diagnostic port functions still require 16G SFPs in the switches. I'm sure I'm not alone in having Gen5 platforms with predominantly 8G SFPs still deployed. That is a good question ... I have started building a matrix for explaining this, but here is some immediate feedback. Your right, Brocade ClearLink diagnostics (aka D_PORT) are only supported with 16Gb SFPs. This is the only Fabric Vision feature that is "SFP dependent". As the market leader for 16Gb Brocade was able to convince the 16Gb SFP suppliers to add the necessary features into the SFP in order to facilitate diagnostics ... hopefully the Ethernet SFP providers will follow. We have diagnostics for everything else and SFP / cables need them too. For now 16Gb FC is the only network with SFP / Cable diagnostics. Some other Fabric Vision features are dependent on the underlying Brocade hardware (ASIC). However, the 8gb generation supports almost all the Fabric Vision features. All in all, the 8gb products are well represented in Fabric Vision ... but each new generation continues in the tradition of better resiliency features. and availability. MAPS helps users to uncover potential problems in the SAN fabric BEFORE they impact applications. 8 Gb SFPs in a 16 Gb platform is very common: why invest in 16 Gb when you don't jave 16 Gb equipment yet? that's what we'll be doing next year as well. Want to know this feature integrated in FOS 7.3 ,or need a separate license and installation required. "One of the new tools included with Fabric Vision is ClearLink Diagnostics, which leverages the ClearLink Diagnostic Port (D_Port) mode to ensure optical and signal integrity for Gen 5 Fibre Channel optics and cables" ....Can any one elaborate more on this feature. Can we please get more information about the requirements for this deployment? The Fabric Vision License is bundled with all Connectrix DCX and DCX 8510 chassis. The Fabric Vision license is a la carte for the fixed port switches, but may be grandfathered on existing systems that already purchased both the Fabric Watch and the APN license. With Fabric Vision enabled, the ClearLink Diagnostic (in FOS v7.3 in particular) integrates MAPS threshold based monitoring and altering capabilities with D_Port. It adds a new pre-defined group (ALL_D_PORTS) so that flexible rules applicable only to D_Ports can be defined. Without Fabric Vision, the manual method of monitoring D_Ports is still available. Absolutely there is no issue with using 8Gb SFP in 16Gb capable ports, especially when you already own the 8Gb SFPs and your end devices are 8Gb it is a no brainer. Note that as with the past speed transitions (2 to 4, 4 to 8), eventually the 16Gb price will become the same or very close to the 8Gb SFP price so for future purchases be sure to check pricing before assuming 8Gb will be a lot cheaper than 16Gb. The Brocade Fibre Channel 16Gb SFP's are unique in the networking industry in that they support diagnostic loopback modes. Even if you are not planning to use 16Gb right away, if you think you will need them soon enough then consider upgrading to 16Gb at initial deployment. Especially if you are having new structured wiring installed so you can pre-validate the patch panel and cable pulls. Alternatively if you do plan to use 8Gb but still want to validate your cable plant, you can just use 2 Connectrix B-Series fixed port 16Gb switches at either end of the cable path to test all the new cable infrastructure before deploying the new 16gb switches into the fabric as planned. We have many examples of customers reporting ClearLink was extremely valuable in vetting new cable infrastructure implementations. It is eye opening how many marginal issues due to crimped cables or bad connector mating that exist day 1 that previously went undetected but introduced intermittent link errors on a connection for years to come. The industry finally has diagnostics for the #1 issue in the data center - SFP and optical cable connectivity!